in bespoke rods, tubes and trims. 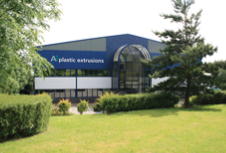 Located in a modern purpose built factory in Burnley, Lancashire, A1 Plastic Extrusions specialise in customised and standard ridged and flexible plastic profiles, tubes and rods. We have the production resource to supply extruded plastic components to many parts of manufacturing industry. A1 provide a development, manufacturing and sales liaison process including tooling development, to deliver the right product, on time, at a competitive price.